Ph.D. Neuroscience is a 3-year full-time doctorate program in the study of Neurological science. The eligibility of the program is qualifying M.Sc. degree or M.Phil in Neurological Science with a minimum aggregate of 55% and above from a recognized university. Admission to Ph.D. Neuroscience course is offered on the basis of Merit obtained in the qualifying examination. Applicants are required to pass the state and national level entrance examination conducted for admission to Ph.D. programmes. However, some reputed colleges and universities may conduct a personal interview and group discussions. Candidates are required to submit a thesis proposal which would be evaluated by the faculty at the time of interview. The course acquaints candidates to the different aspects of Nervous system blending it with the discipline of neurology. Ph.D. Neuroscience offers to candidates an integrated view of neuroscience combining it with the intricacies of research. Candidates should be able to work in a team as well as should have effective communication skills for conveying their message to different people and patient. They should have the skills of writing, must be experienced in report writing as well as converting ideas into practice, Having the ability to conduct good diagnoses and the knowledge of statistics to solve complex issues is deemed to be beneficial. 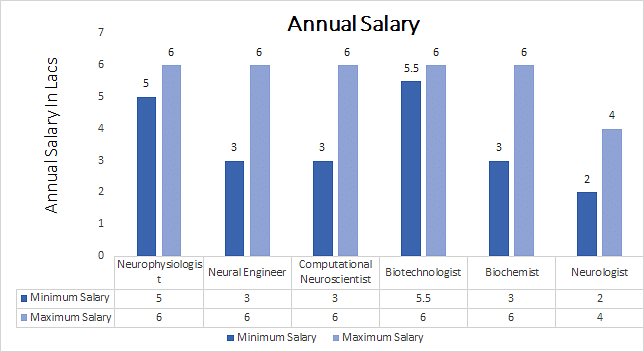 The average Ph.D. Neuroscience program fee charged in the colleges in India ranges from INR 15,000 to 3.20 lacs. Doctorates of the program has wide prospects in areas associated with Accountancy in government and private firms such as Pharmaceutical Companies, Forensic Science Labs, Mental Health Centres, Psychology Centres and much more. The average salary earned by the students ranges from INR 2 to 6 lacs per annum. Eligibility Qualifying M.Sc. in Neuroscience or M.Phil in Neuroscience with 55% from a recognized university/ Entrance examinations conducted by universities such as PET/JGEEBILS, JEST, NET, etc/ personal Interview. Top Recruiting Companies Genetic Counselling Centres, Psychology Centres, Pharmaceutical Companies, Forensic Science Labs, etc. Job Positions Neural Engineer, Computational Neuroscientist, Biotechnologist, Database and Databank Manager, etc. Ph.D. Neuroscience: What is it About? The field of Neuroscience integrates the study of aspects related to Neurology and its other disciplines. Ph.D. Neuroscience course explores the field of biology which is a combination of life sciences, ancillary, Biochemistry and Health Sciences. The course lays to candidates a platform for understanding the interdisciplinary concepts related to the field. Doctorate in Neuroscience enables candidates to gain proficiency in polishing their skills of communication, analysis, and diagnosis of serious ailments. The program covers the aspects of neuroscience which builds in them the competence to conduct research about the serious ailments, enabling them the ability to work independently, interpret and develop a hypothesis to bring a solution for the ailments. Ph.D. Neuroscience students are imparted with the experience of generating reports, enhancing their writing skills, expressing complex ideas with proficiency. They are also skilled in the aspects of recording data, analyzing it, imbibing in them the ability to experience MRI and spectroscopy with the knowledge of experimental designing. Ph.D. Neuroscience curriculum is thus designed in a manner to make students competent to dissert information as well as carry on their research work. Candidates are imparted with the advanced knowledge to develop in them high expertise studying of the subject. The subject includes topics like Neuroanatomy, Genetic and Molecular Biology, Biochemistry, Sensory and Motor Systems and much more. Using the comprehensive methodology of combining theory and practice along with field study, the course works in making them proficient in their field. The course prepares candidates to become proficient researchers and neuroscientist with finesse. The course enables them to choose their career in wide areas surrounding the areas including Genetic Counselling Firms, Health Sciences, Mental Health Centres, Forensic Science Labs and much more. Ph.D. Neuroscience course aims to instill in candidates the necessary fundamentals of neuroscience so as to make them competent in applying it in their field of career. Candidates should have completed their M.Sc. in Neuroscience or M.Phil degree in the respective field with a minimum aggregate of 55% and above from a recognized university. Admission to Ph.D. Neuroscience is done solely on the basis of Merit. The eligibility criteria for admission is qualifying M.Sc. or M.Phil in the field of Neuroscience with a minimum aggregate of 55% and above from a recognized university. However, the eligibility criteria are subject to differ according to the norms prescribed by different colleges. However, candidates are also required to pass the various state and national level examinations held for Ph.D. Neuroscience program. Certain universities may conduct the session of Personal Interview and group discussion for gaining a deeper view about the personality traits of the students. The marks obtained in qualifying tests and entrance exams is thereby calculated to obtain the merit which is subject to differ for various universities. Candidates can apply for Ph.D. Neuroscience course both online as well as offline. All information regarding admission dates, counseling and selection of the candidate will be notified through email or listed on the official website of the college. The course is designed with a view to impart candidates the maximum understanding of the subject from different perspectives. The course offers the students a medium to enrich their knowledge about the field of neuroscience and gain an intricate focus on developing methodologies of conducting research and generating thesis. Ph.D. Neuroscience course enables candidates the medium to imbibe literacy about computer systems, diagnosing ailments and much more. Students of Ph.D. Neuroscience after the successful completion of the program have a variety of opportunities laid in the field of Neuroscience and its research. They have opportunities in the area of Public Health Sciences, Genetic Counselling Centres, Psychology Centres, Pharmaceutical Companies, Forensic Science Labs, Mental Health Sciences as well as in the position of professors at reputed universities and colleges. Ph.D. Neuroscience doctorates can become Psychophysicist, Neurologist, Neurobiologist, Biochemist, Animal Neurologist, Educational Psychologist, Psychopharmacologist, Biotechnologist, Neuropathologist, Neurophysiologist, Neural Network Researcher, Neural Engineer, Computational Neuroscientist, Biotechnologist, Database and Databank Manager, Community Mental Health Worker, Researcher and much more.